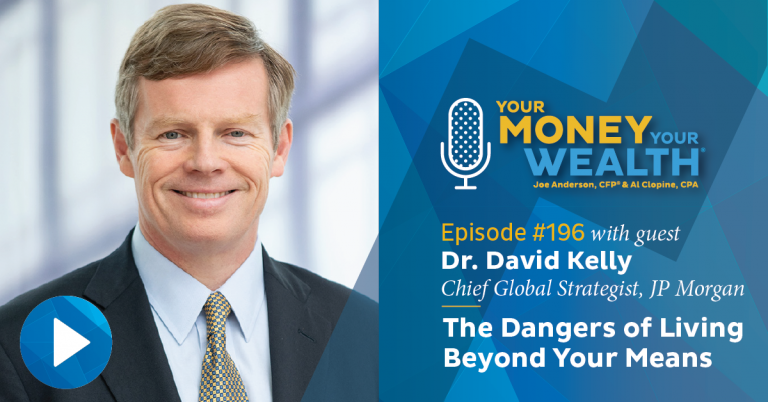 JP Morgan’s Chief Global Strategist Dr. David Kelly discusses the mid-term elections, market volatility, interest rates, tariffs and trade wars, Brexit, his 2019 economic predictions, and what all of that means for you and me. How should you be invested now? Dr. Kelly also gives his opinions on value versus growth stocks, international stocks versus US stocks, emerging markets like China, and other asset classes like bonds and commodities. Plus, Joe and Big Al have money-saving year-end tax strategies and answers to your money questions: should you sell stock to pay back taxes, and should you take investing advice from one of the big name investment companies? (42:21) Should I Sell Stock to Pay Back Taxes? Happy Thanksgiving week! I’m thankful that today on Your Money, Your Wealth®, JP Morgan’s Chief Global Strategist, the very intelligent and engaging Dr. David Kelly, joins Big Al Clopine and Pure Financial Advisors’ Director of Research, Brian Perry, to discuss market volatility, the mid-term elections, interest rates, tariffs and trade wars, Brexit, his 2019 economic predictions, and what all of that means for you and me. How should you be invested now? Dr. Kelly also gives his opinions on value versus growth stocks, international stocks versus US stocks, emerging markets like China, and other asset classes like bonds and commodities. Plus, Joe and Big Al have some money saving year-end tax strategies, and as always, answers to your money questions: should you sell stock to pay back taxes, and should you take investing advice from one of the big name investment companies? The answer might surprise you – it surprised me! Kicking things off with Dr. David Kelly, here are Brian Perry, CFP®, CFA®, and Big Al Clopine, CPA. AC: David, thanks for joining us. DK: Glad to be here. AC: And we’ve got just I guess a million questions about the market, because we’ve had a lot of volatility lately, and a lot more so than maybe we’ve had in the recent past, so maybe let’s just start with, why do you see that there’s more volatility right now than there has been? DK: Well, I think the real issue is that volatility had been very low all year. And what we’ve seen in October really wasn’t that dramatic. I mean, you’ve got to remember we’ve got the Dow at these levels. If you have a hundred point day or a 200 point day, that’s not really a big deal. It’s not that volatile. So the stock market’s always somewhat volatile and it had been very calm. It’s got a little bit more volatile. Why? Well, this is an old expansion. We are in the 10th year of an economic expansion, the 10th year of a bull market. People are a little bit nervous. People remember the last two big bear markets where the stock market fell by 50% and they don’t want to get hurt by it. So when things come up, like Brexit or trade worries or just worries about the election or worries about future earnings, these things I think are causing a little bit of volatility right now. BP: You mentioned that it’s a really long economic expansion at this point, and we’re seeing the Federal Reserve tighten interest rates, which tends to be a late-cycle phenomenon. Vice Chair of the Fed comes out and says we’re getting closer to a neutral. How much further does the Fed have to go, and when is that going to start to really impact the economy? DK: Well, I think that they do need to move to neutral. I think that’s OK. Now, they’ve actually defined neutral, because in their own forecast they say that in the long run if they’re doing everything right in monetary policy, the Federal funds rate ought to be at about 3%. Now, they’re right now between two and two and a quarter percent. So if they raise rates when they meet in December, and then raise rates in March and in June of next year, and they raise it by one-quarter of 1% each time, then by June of next year, you’re between 2.75% and 3%. And that’s pretty much what they think is neutral. So I think that’s probably where they’ll stop, or at least pause, and I think there’s going to be a change in market sentiment on this, because the Fed themselves have said, “we’re going to go past that.” I really don’t think they are. I think that if they get to neutral, that’s probably OK for this economy. I think they should move to neutral. I don’t think they’ll move past that. AC: Let’s talk about the midterm elections, because there was a lot of interest in it, and things happened as we kind of expected. But how does that potentially affect the market going forward? DK: Well, first of all, it was as expected, and that’s important. That’s why I don’t think we’ve seen a huge market reaction to it. I think the second thing, and a very important thing, is don’t let how you feel about politics overrule how you think about investing. Just one sort of statistic I think is fascinating is that if you go back over the last 50 years, the US stock market has given you about 10% per year, which is really excellent. But in the eight years between President Obama’s election and President Trump’s election, the stock market gave you over 12% per year. And the two years since President Trump was elected, the stock market has given you over 15% per year. So there’s been a huge bull market while President Obama was in charge, and a second bull market where President Trump was in charge, and there are an awful lot of Democrats who’ve missed out on the Trump rally and Republicans have missed out on the Obama rally. So I think it’s very important not to get too obsessed with politics. The other thing I’d say is, yes, we’ve got divided government, that’s the norm. More than 60% of the time since World War 2 we’ve actually had divided government. But I do think it makes a difference because if the Republicans had control of everything, I think we would have seen tax reform 2.0. We would have seen more infrastructure spending, we might’ve seen more defense spending. I think we would have had bigger deficits. So I think divided government is going to slow down the amount of government stimulus. But actually, I don’t think that’s a bad thing. I think this economy is running at full employment. You don’t normally give it an economy at full employment stimulus. So in a way, I think this is OK that we’ve got divided government, that we don’t see more stimulus at this point in the cycle. BP: From a political perspective, one of the things that’s really been gyrating markets has been trade discussions. Does the recent election have any impact on whether or not we see continued tariff wars? DK: I think it does a little bit. I mean, the administration gets to enact trade policy. Years ago the Congress more or less ceded control of trade policy to the executive. And there’s no way they can take that control back. So the president does get to make trade policy, but I think he is, as we move past the midterm elections, he will focus more on 2020. And one of the problems is, remember I said we’re not going to get more stimulus? I think that’s true. Therefore, the economy is probably going to be slowing down a bit. And again, that’s OK. I think it’ll slow down to about 2% growth in the second half of next year and going into 2020. But the one thing the president wants to avoid is an actual recession. And one of the problems is that tariff wars are very damaging to the global economy and they’re very damaging to the US economy, they fill the atmosphere with uncertainty, that causes investment spending to slow down. If you raise tariffs on Chinese goods it’s going to slow down consumer spending. So to some extent, I think it puts pressure on the president to try to come to a deal with China. And my instinct and I must admit there’s a lot of opinions out there on this, but I think the president actually will come to a deal with China. I think he wants to be the person who makes a deal. He will certainly portray that as being a deal that no other president could have gotten. And I don’t know how that plays politically. But I think, from an economic perspective and thinking about the 2020 election, I think the midterms in some ways make it even more likely that we will see some deal to try and ratchet down tensions with China. I think that’s very important. AC: If there is slower growth coming ahead in the next year or two, and with the lower taxes, then likely the deficit might balloon even a little bit more. And how concerned are you on that? DK: I am concerned – I’m concerned about the deficit the way I am concerned about global warming. I mean, I don’t think that I’m going to be killed by it right now, but I think it’s a bad trend and we ought to do something about it. I mean, the truth is, we are at full employment. The unemployment rate in the United States is the lowest it’s been since 1969. And so if you’ve got an economy that’s healthy, it’s kind of like – you know, to me this extra deficit spending is kind of like bringing an extra keg to the frat party at 2 a.m. I mean, it makes for a louder party but it ultimately means a bigger hangover. And to me, the problem with the deficit is not that it’s going to blow us up. It’s just going to make us poorer in the long run. It’s just like in your own finances. There are people in their 50s and 60s, should they be taking out another credit card? Should they be borrowing more money at that point? Well no, because they’re going to need to live off that money in retirement. And 10 years out, we’re going to have a debt. The national debt is going to be about 100% of GDP, and two-thirds of that debt will be owed to people overseas. And so at that point, we will be paying taxes to fund the retirement of the Germans and the Japanese rather than fund our own. So if we live beyond our means today, we’ll be forced to live beneath our means in the future. I don’t think that’s a very responsible thing to do. BP: So given that the average individual doesn’t have a whole lot of control over that eventual outcome, what steps can they take today to protect themselves? Because that’s pretty troubling, what you’re laying out. DK: Well yes. I think people do need to think about it from exactly that perspective. And I think the mistake that people make is they worry about the deficit, “oh the deficit’s going to blow us up, we’re going to be Argentina, we’re going to be Greece,” and they freeze and they don’t do anything. And they actually pull back and put money in cash rather than investing. Actually to me, what it really says is, this deficit is it is a shake-up call and a wake up call to people. They need to do more for themselves. All the way through to this point, the federal government has been spending more than it’s taking in taxes. In the future, it’s going to take more in taxes than it spends. Where is it going to cut spending? It’s going to cut spending on older Americans and on Medicare. It has to because that’s where all the growth is. Where is it going to raise taxes? It’s going to raise taxes on richer people. So if you happen to be older and richer than average, there is a target on your back. And you know it’s kinda like the scene in Jaws where Chief Brody looks out over the back and he sees the shark. He runs into the captain he says, “we need a bigger boat.” (laughs) Investors need a bigger boat because this deficit’s going to make it more difficult for them in the long run. AC: We haven’t heard too much about Brexit lately. But let’s talk about that and its potential impact on the global economy and the US as well. DK: Yeah. I still think that Brexit is a big splash for Britain and rather a small ripple for the rest of the world. And in fact, even just in the last few days, Britain has come to a sort of a tentative agreement with the European Union. But Theresa May, the British prime minister, is having a terrible time selling it to her own cabinet or to her own party. And so it looks like this draft agreement will not get through the House of Commons in Britain, and that could mean that Britain leaves the European Union without a deal, which would be a disaster for Britain. It could mean another general election in Britain, or another referendum which I think would be the best outcome. Ultimately, I don’t think it hurts the Europeans that much, it doesn’t hurt the global economy, it’s just Britain. Britain needs to trade. Britain cannot afford to have a trade barrier with its biggest trading partners, nor can Britain afford to have a hard border between Northern Ireland the Republic of Ireland, because that could set off troubles which have really been a problem for Britain and Ireland for 600 years. So this is what comes of populism. I mean, I try not to be political, Republican versus Democrat, people are tired of their opinions, but populism is basically when you shut off the left side of your brain and you just do what feels good. And Brexit felt good to a lot of angry people in Britain. But it was a terrible own goal. It’s a stupid thing to do. And I just hope that they have the good sense to give themselves a chance to reconsider, now that they see what’s going on, this can only harm Britain. I do hope the British Parliament gives the British people the opportunity on a do-over on whether they really want to do this thing because they really shouldn’t do this thing. BP: I liked what you said about shutting off the one side of your brain and doing what feels good in the moment because I think that whether it’s letting political views change people’s views of the economy, or whether it’s a bias of, “hey, I want to invest in whatever has done the best lately and deviate from my long-term plans,” people are so subject to that. And so looking at a couple of the trends we’ve seen over the last few years, do you see them continuing? And maybe starting with this year, U.S. stocks have done quite a bit better despite the volatility than international stocks. What do you think of international versus US? DK: I would be overweight international versus US. Right now, the U.S. accounts for 56% of global stock market capitalization. That is the biggest number we have ever seen. And I think it’s too big. And if you look at overseas economies, you got more room to grow in the long run. I mean, we’re at full employment and the working age population is not really growing very fast. There’s plenty of unemployment in Europe, there’s plenty of growth potential in emerging markets, European and emerging markets stocks are a good deal cheaper than U.S. stocks, so are Japanese stocks. I think the dollar is too high and it’ll come down over time. So logically – again, this is where you switch on the left side of your brain – logically, International looks like it really ought to do better than US over the next five years. I can’t tell over the next year or so, I mean nobody can. But think about what’s happened: what’s happened is this, it’s like a marathon. You’ve got all these people running in a pack, and then somebody runs ahead. They become the hare. And that’s the US this year. Because of all this fiscal stimulus, the U.S. picked up in the rest of world sort of slowed down. But this fiscal stimulus is mostly sugar, and the US economy will slow down again and the pack is going to catch up. And in fact, even if the Federal Reserve stops raising rates the rest of the world, the European central bank is gonna start raising rates and that should bring the dollar down. So in the long run when I look at it, I think international will beat the US, and I think people should make sure they are not underweight International right now because so many Americans are. AC: Yeah I think that’s right because there tends to be such a home bias in investing, you kinda invest what you know. But speaking about US investments, what about growth stocks vs. value? Because growth stocks have been kind of the winner for a number of years here. DK: They have, and I think there’s a lot of momentum going on. I think one of the things that’s happened is people have moved money from actively managed funds into passively managed funds. The problem is that a lot of the active fund managers look at valuations and they were overweight value. And the problem is that every time somebody sells out of an actively managed fund and moves into a passive fund, they’re implicitly moving from value to growth and I think that’s really helped growth outperform. But I always like to think about this. Don’t think about the next year, think about the next five years. Let’s move through a cycle and a few events here: overall, value stocks are a little bit cheaper than growth stocks relative to their history, and if you look at that history, that history includes the tech bubble. So when I think about that, I think value stocks are really significantly cheaper than growth stocks. At the moment I think the big trend is still rates are going to rise, be overweight cyclicals versus defensives. That’s kind of how you should split the market up, rather than value versus growth. But in the long run, I do think value will beat growth and particularly small-cap value, which tends to get left behind in this kind of market. I want to have a chip at every square. But if I had an extra chip, I’d put it down in small cap value. BP: What about, as you think more broadly to a portfolio, a lot of people, maybe they own a few international stocks, maybe they own some US stocks. What about other asset classes, whether that’s bonds, commodities? How should people be looking at some of those asset classes now? DK: Well I think, first of all on bonds, for a long time it has been sensible for most investors, particularly younger investors, to be overweight stocks versus bonds, because long-term interest rates are being held down very low by central banks. But we are seeing those bond yields move up. And if I’m right and the Federal Reserve just raises rates three more times, then today’s number – I think we’ve got a 10 year Treasury yield right now of 3.1% – so if we ended up with 350, you’d get hurt a little bit on that. If that’s where you are by next June. But I think that’s about the extent of it. So I think people should gradually be moving to a more neutral position between stocks and bonds, relative to where they would normally be. On commodities, I think it’s OK to have some exposure to commodities. I certainly wouldn’t be overweight commodities because I don’t think this is a very inflation-prone global economy. And I think commodities are particularly useful when you think inflation is going to go up. But I’d have some commodities I think, and look at various alternatives also within asset classes. I think you have to be very flexible at this point. But I think the number one thing I’d do is make sure that I had enough international equities versus U.S. equities. AC: Let’s talk a little bit about emerging markets and China’s impact on emerging market investments. What are your thoughts there? DK: Well, China is gradually slowing down. I have not seen any evidence that China is in crisis. I think China, of course, controls the data coming out of China very heavily. But even talking to people on the ground in China, things are growing a little bit more slowly, but it looks like it’s OK. I think the Chinese are very nervous right now about this trade war. I think actually all of Asia is nervous about the trade war because Asia’s really built on exports and they will get hurt very badly by a trade war if it comes to pass. So I think, really, your opinion on how that one plays out really will have a big impact on emerging market stocks in general because most emerging market stocks are actually in Asia. So I think it’ll have a big impact on that. But overall I am relatively optimistic because trade wars are just bad and they don’t work. They never achieve the goals that they’re setting out to achieve. So I don’t think that we’re going to be in a perpetual trade war, and when we get some sort of agreement, I think that could be a signal for emerging market stocks and particularly Chinese stocks to rally. BP: If we step back and look more at fundamental investment principles, one thing that your firm puts out every quarter is the Guide to the Markets, which is a fantastic publication. And there is a chart that you put in there that looks at the last four decades or so, and it turns out that in 75% of those years or so, the stock market has ended up, but during that year there’s been a pretty significant intra-year decline despite the eventual positive gain. Can you talk a little bit about how people should react to these periodic sell-offs and the fact that over time there’s an upward momentum to the market? DK: Yeah, I think that’s right. And I think people do tend to react out of fear whenever they see a sell-off, and of course, that gets to something we were saying earlier on about how people doing what feels good just gets them to trouble. So that’s why the average individual investor usually doesn’t get the full potential of markets because they tend to buy when they feel good and sell when they feel bad. And of course, they feel good when markets are high, they feel bad when markets are low. So I think people do need to look at the long span of history, and I think you should also look at the economy first and then look at markets. Because for example, in international stocks so far this year, we haven’t seen a big slowdown in the global economy. We haven’t seen a big fall in global earnings. What we’ve seen is a fall in some international currencies, which I think is temporary. And we’ve also seen a fall in the PE ratios in some of these stocks, but that can always bounce back. So looking at the fundamentals in the US, we are in the 10th year of an economic expansion. I think we will make it to an 11th year, which will make this the longest expansion since the Civil War. We’ve got very low unemployment, but what’s really interesting is this low unemployment is not triggering the kind of inflation you’d normally see. So we’re almost getting a free pass on strong growth here. And then we’ve got spectacular corporate profits. In the first three quarters of this year, corporate profits were up 27%, 27%, and 32% year over year if you look at operating earnings per share. Now I know profit growth is going to slow down and everybody’s focused on future earnings growth, but I think a lot of current earnings now which are pretty good. So when I look at those fundamentals I think about a Federal Reserve that’s being patient, I think about a global economy which is pretty balanced and growing okay. I think about what tax cuts have done for valuations, and they have made stocks cheaper. I think when you look at those fundamentals you realize that this bull market in stocks is really built on fairly firm foundations. Now, I don’t think stocks are giving great returns from here because frankly, they’ve come a long way. But I think people should not be too worried about a big sell-off that will persist. Again, remember, you’re planning for an entire retirement and maybe for your heirs. Your investment plan, for most people, what the real long-term investment goals should be is measured in decades, not in months or years or weeks. So I think you should take these sell-offs, you can always look at them, look at the fundamentals. Is that justified? But if the fundamentals don’t justify the sell-off, then that’s actually time to get in, not to get out. I’ve never seen a good long-term investment that didn’t feel uncomfortable at the start. And it always feels uncomfortable in the middle of a sell-off. That’s usually the best time to buy. AC: David, this has been such good information. Any other final thoughts before we let you go? DK: You know, I think 2019 is going to be… it could be a challenging year. But again, I’m just going to sort of reiterate sort of the theme of what we’re talking about here is, you’re just trying to activate the left side of your brain. Look at the world logically. Try to put the political emotion aside and think about how things are going to play out. And try to suppress your prejudices which cause you to stay away from international, cause you to get out of markets when markets sell-off, the good fundamentals underlying markets, and people should still be long-term investors. AC: Good advice. How can people find out more information about you and some of the things that you’re putting out there? DK: Well two things, first of all, you can go to JPMorganFunds.com and you can find our Guide to the Markets which you kindly mentioned, which we put out every quarter, that we update every month. Or also I’ve got a little LinkedIn blog which I do every week just on some thoughts on the week ahead and what’s going on in markets so if anybody wants to find me on LinkedIn it’s just David Kelly at J.P. Morgan on LinkedIn. AC: So Dr. David Kelly, thank you so much for joining us. 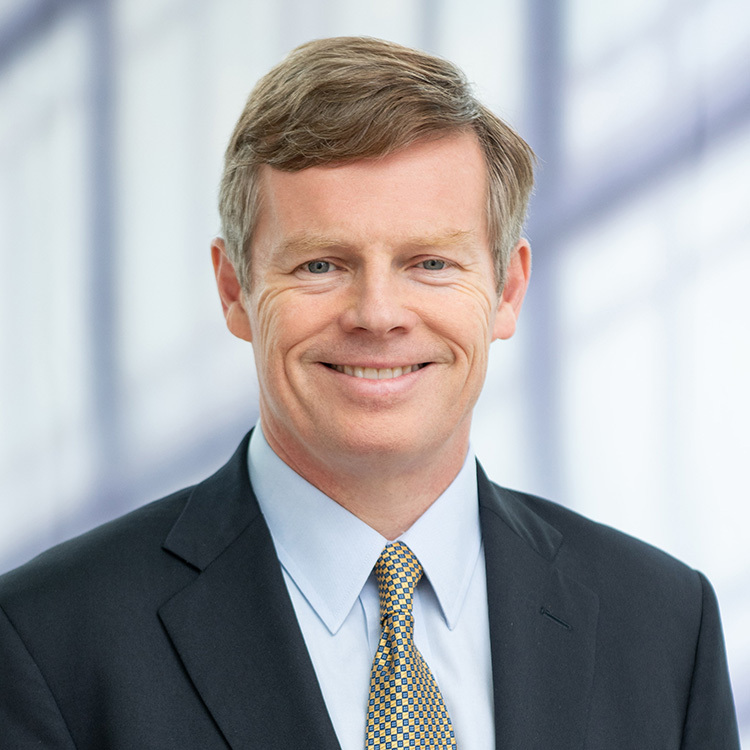 He’s the Managing Director, Chief Global Strategist at J.P. Morgan and Chartered Financial Analyst, a very smart guy as we just heard, so thank you again so much. Of course, you know you can find all the relevant links mentioned in the show notes for today’s episode at YourMoneyYourWealth.com. If there is someone you would like to hear on the podcast, email your suggestions, comments and questions to info@purefinancial.com. Now, as the year is winding down, it’s time to talk about some year-end strategies for saving money on your taxes. Also in the show notes, you’ll find a link watch the Your Money, Your Wealth TV episode (below) on how the new tax law might affect your retirement. JA: Alan, did you know that probably almost half of U.S. citizens do not pay any income tax whatsoever? AC: I did know that. I think what’s probably surprising to a lot of people is that half of the country’s paying all the taxes for everybody. JA: But I look at it a little bit differently. Is that when people hear ideas or things in the media, or let’s say Money Magazine, Kiplinger, you listen to radio shows, TV shows, and you look at these grandiose statistics. Like you’ll be in a lower tax bracket in retirement. Well yeah, most people will be in a lower tax bracket in retirement, because they’re not even paying any tax. It’s hard to get better than that. You know what I mean? AC: Yeah, because then they don’t have any savings and Social Security will be tax-free because that’s the way that’s done when you have no other income. JA: Right. So when you look at half of the population doesn’t pay any income tax. The other half does. So if I’m looking at, you hear the statistics of the United States as a general whole. Well yeah, it’s going to shift more towards those individuals unfortunately. There’s a lot of inequality, I guess, and I don’t want to get political, here but I think a lot of times you hear things and then you think it applies to you, which could be the exact opposite. Because 5% of wage earners pay almost 55%. AC: Yeah the top 5% pay, yeah, you’re right, over half. JA: Top 10% pays about – almost 70, 66%. And that top 10%, that AGI is not as big as you think, Al. Do you know what it is? AC: Yeah, I think it’s around $130,000 something? JA: Yeah. $138,000. So if you make $138,000 you’re in the top 10% of all wage earners in the entire country. A lot of our listeners probably have a combined income of that. There’s a lot of single people that listen to the show probably have income like that. So welcome to the top 10%. But then you hear, no, you’ll be in a lower tax bracket and blah blah blah. You kind of start tuning the stuff out and then you don’t necessarily know what direction to go. So hopefully that puts things in perspective. So Al, let’s break some things down if you’re an employee, investor, retiree or whatever. AC: Yeah I think right off the bat now, we only have a month and a half, let’s say. But still consider your IRA, still consider your 401(k)s. IRAs of course you can contribute till April 15th of next year. It’s still $5,500 per person or $6,500 if you’re 50 and older. SIMPLE IRA, if you’ve got that kind of plan at your employer it’s $13,500, you have to do that by December 31t. Do another $3,000 if you’re 50 and older. And don’t your 401(k) – so that’s $18,600 with an extra $6,000 if you’re 50 and older. That has to be done by December 31st. Now, that’s if you’re an employee. If you’re an employer, you can fund the profit sharing parts of like a 401(k) for example, until the due date of the tax return. So you got a little bit more time there. So again, you’ve got maybe just a few more weeks to make sure, at least if you have a 401(k) or a SIMPLE IRA, you’re maxing that out to the extent that you can afford it, because you’re going to pay less taxes to the extent you’ve done that. JA: Right. A lot of you, if you do have some additional savings and you realize that you didn’t max out your plan and you want to, don’t get confused that you think it’s a percentage of income because it’s not – it’s dollar for dollar. So you’re like, “well I’m already maxing it out.” How many times do we hear that? “No, I put 10% in that’s the max.” No, well 10% of your salary is $7,000. You can put in a lot more than that. AC: Yeah, and Joe, there were plans 20 years ago that limited to how much you can put in as a percent. Virtually all plans that we see now it’s unlimited. You could put in as much as you want, even 100% if you want to. JA: Up to the $18,500 or $24,500. AC: That’s right, up to those limits. JA: So if you made $20,000 a year, you could virtually shelter almost 100% of your income minus payroll tax. AC: Yeah exactly. So a few other things Joe is there were a bunch of tax law changes in this current year, and I think it’s important to review those while you’re thinking about year end planning. The first is the standard deduction increased – it just about doubled. So a single taxpayer was a little over $6,000 standard deduction that’s $12,000. Married was almost $13,000 but now it’s $24,000. So what that means is, less of you will be itemizing, and itemized deductions is taxes and interest and charity, things like that. So if less of you are going to be itemizing, it may not make any sense to prepay a mortgage payment or to make an extra charitable contribution if you’re not going to get any benefit for it – you may want to do those things anyway, but it may not help you tax-wise. JA: Right. In most cases it probably won’t. AC: Yeah and then when you consider itemized deductions, for those you that can still itemize, there were some big changes. The biggest one probably Joe was property and state taxes. So now that upper limit is $10,000, that’s as much as you can deduct. And for those of you living in California, with high property taxes and high state taxes, in many cases your deduction was $20,000, $30,000, $50,000. Anyway, that’s limited to $10,000 on state and local taxes. So you’re probably going to have a lot lower itemized deductions because of that. JA: Yeah, this killed a lot of people in a lot of high tax states. AC: Yeah, only, right? Which sounds like a lot to a lot of people, that it is. But it used to be a million bucks you could borrow and fully deduct the interest. Now if you had a million dollar loan prior to December 15th of last year, that gets grandfathered in, but your home equity loan debt that you could deduct last year up to $100,000 of debt, that’s gone. You can’t do that anymore in 2018. JA: Right now we’re seeing some volatility in the overall markets. One of the strategies that you might want to consider is something that’s called tax loss harvesting. I think most people don’t understand this, Alan. AC: Yes, I would agree with you. JA: Let me try to give you a quick high level view of what the heck this is. AC: Yeah it’s easy if you draw it out. We’ll see how you do with your words. JA: Yeah, let’s assume that you purchased an asset and that asset is worth $10,000. This asset has to be outside of your retirement account, so it could be a mutual fund. It could be a stock, it could be a bond, it could be whatever. AC: So I bought a mutual fund for $10,000. JA: And it’s outside of your retirement account, it’s in a brokerage account. The market is volatile, and all of a sudden that $10,000 drops to $5,000. AC: Okay. Not a very good investment. AC: (laughs) OK, well I got schooled. JA: Yes yes did. So here’s the concept of this, is you want to harvest losses as the market continues to be a rollercoaster. So the mutual fund that you bought for $10,000 is now worth five. What I would suggest you do is to sell that mutual fund, but not necessarily abandon your overall investment strategy, but buy a similar mutual fund that is in a similar asset class. So I still want you to be in the market, but what happened, you took that $5,000 loss in you harvest it. It’s now sitting on your tax return. It’s called a capital loss. It will sit on your tax return until you use it to offset any capital gain. So now the market recovers, because you sold mutual fund A, but you bought mutual fund B. So you had the S&P 500 index fund. You sold it and you bought the Wilshire 5000 index fund. Or the Russell 2000, or something like that. AC: So you’re still in the market. JA: Still fully invested. Then, if the market recovers and you need to sell something, well, you have this $5,000 loss that you harvest that could offset any future gain. AC: Right. Dollar for dollar. And I think that’s what people don’t really understand. It’s a capital loss, and if you don’t use it, it gets carried forward to the following year, it goes against capital gains dollar for dollar until it’s used up. JA: Absolutely. And if you do not have a capital gain, then what happens is that they will allow you to take $3,000 of that capital loss and offset it against ordinary income. AC: So that would be like against salary or interest or something like that – pension income, for example. And that’s the problem. A lot of people think you only get a $3,000 benefit. JA: That’s the biggest problem, “well, I got a $50,000 loss, what’s the big tax deal, it’s only $3,000.” Well, that’s against a totally different tax. AC: Right, if you have capital gains, it goes against that dollar for dollar. And sometimes people that even understand that, they look in December, they say, “OK I’ve got $20,000 of gains. What loss can I harvest to offset it?” But not always, sometimes the stock market’s really high in December. And so you may not be able to harvest anything, so you kind of have to be looking at this throughout the whole year. JA: Yeah, and if you haven’t looked at it, make sure that you look at it now. AC: Especially with the volatility. JA: Right, because there’s probably some losses in some of your positions, potentially, and this is a really good time to take a look at it. All this tax planning and strategy implementation needs to occur prior to December 31st – that’s only a few weeks away, depending on when you listen to this podcast. Make sure you’re taking advantage of all of the changes from the latest tax reform and paying as little tax as legally possible. Download the 2018 Tax Planning Guide and the Tax Checklist for free – find links to both in the show notes for this episode at YourMoneyYourWealth.com For more personalized help, click the “Free Assessment” button at the top of the page at and schedule a free tax analysis and retirement assessment with the team of professionals at Pure Financial Advisors. Visit YourMoneyYourWealth.com. JA: We’re talking about tax loss harvesting, which is a extremely exciting topic. I almost fell asleep just saying that title. AC: (laughs) You almost fell asleep while you were talking? JA: Yes. Tax gain harvesting, Alan, is another thing that people should potentially take a look at if you do have gains in your overall portfolio. AC: Yeah and I think this is a mystery to a lot of people. It’s like, “wait a minute, I thought you just said we needed a tax loss harvesting?” Well there’s a completely opposite strategy if you’re in a low enough tax bracket. For example, if right now you’re in the 10 and 12% tax bracket, which goes up to about $38,000 single, about $77,000 married – and change – anyway, if you’re in that area, if you’re below that, then you can actually sell some of your capital gains, your long term capital gains, you have to hold it for a year and a day, and you’ll actually pay zero capital gains tax. So let me give an example. So you got $50,000 of taxable income and you’re married. So I just told you you could go up to $77,000, so that means you could have $27,000 of long term capital gain on your federal return and pay zero capital gains tax. It’s like it was tax-free. Now, full disclosure, you will pay tax in your state, depending upon how they do it. In California it’s still taxable, but on the federal return, it’s tax free. And so a lot of folks are trying to avoid selling their positions and rebalancing and getting an appropriate investment portfolio. And even though they need to do it, and they wouldn’t even pay any tax or any federal tax doing it. JA: Well, if they love that stock, they could buy it back that same day. AC: Yeah actually that’s another good strategy. JA: Just increase your basis so that when you do finally sell it down the road there’ll be less gain. So yeah, I think that’s a good one. Now that also works if you’re in higher tax brackets, because maybe you’re near a threshold to where, if you had much more capital gain, you’ll be above the $250,000 threshold, so you have to pay the extra Medicare surtax, or maybe you’re going to bump up against the 20% capital gains rate. So yeah, tax gain harvesting can be pretty effective as well. JA: Hey, we talked to Jefferson Lilly. We will be talking to him about mobile homes. Mobile parks. JA: And real estate investing in general. And I think there’s some other misunderstandings about real estate and taxes. I don’t know where it came about that real estate is the biggest tax haven ever. That’s not necessarily true. AC: It was true over 30 years ago, but that rumor still persisted. What happened Joe was before 1986 you could deduct your losses on real estate unlimited. And by losses on real estate, you don’t even really have to lose money on it – even if you break even cash flow, you get to depreciate your property. And every time you depreciate your property, at least under current law for every million dollars of building that you buy, you probably have about a 25 or $26,000 write off. So you buy $10 million dollars. You got a $200,000+ write off unlimited. And that’s actually how it used to be. JA: And there was no income limitations to it. AC: None. So 1986 we had the Tax Simplification Act under Ronald Reagan. And it was anything but simple. And what happened, among other things, is we got a new set of rules called the passive loss rules. JA: The PIGs and the PALs. AC: Yes. And so the passive loss rules simply state this: which is when you have a passive loss, you can’t deduct it. It just gets suspended on your return until you have passive income. Now there is a workaround at certain income levels. So if your income is below $100,000, you can write off up to $25,000 of your losses on real estate. If your income is over $150,000, you can that write off anything. And if you’re in between there’s a phase out period. So the days of writing off everything you possibly can in real estate are no longer here, and usually, I’ll just say one more thing. A lot of times the people that want to buy real estate have high income, they’re looking for a tax shelter, they’re above $150,000, there is no tax shelter. JA: Right. I wonder how big of an uproar that was back then. Were you practicing in ’86? AC: Yeah, I was at my third CPA firm. JA: Wow, jumping around. You couldn’t hold a job, huh? AC: No. My fourth job, third CPA firm in my twenties (laughs) Just like the current millennials. AC: That’s right. (laughs) So yeah, it was a big deal for the real estate investors because where they had these write-offs, they didn’t. And the concern was that properties now would go down in value because of the loss of the write-off, and what ultimately happened was that the early 80s were not very friendly for real estate. The late 70s were extremely, there was a lot of inflation and real estate went way up. The early 80s, it went down a little bit, not much, a little bit. But by the late 80s after this tax law change, it was phased in over four years. Real estate zoomed again. And partly – a lot of times people say this tax law changes a real estate is going to go in the tank. Well that’s one factor, but there’s a lot of other factors that make things go up or down. JA: Well what, they also reduced the tax rate significantly back then too. Because if I have a 70% top marginal rate, so I’m going to buy real estate to try to get these $200,000 losses sitting on my return, versus saying, “Okay well now I can only write off $25,000 or zero,” but now instead of a 70% top marginal rate it went down to 50. AC: Yeah. Big savings, now we’re at 37%. But yeah, and I remember in the early 80s, my second CPA firm I went to, they were helping these private placements, these limited partnerships. And then I learned what 2 to 1 and 3 to 1 and 4 to 1 means, I had no idea. And what it means, 2 to 1 means I invest $1,000 in this investment and I get $2,000 in tax savings. It’s like, “well how do you do that?” “Well, just smoke and mirrors.” But there was all these crazy rules and it was these limited partnerships that caused the passive loss rules to come into play, because people were doing crazy things that had no investment potential, just to get the tax write-off. AC: How much is a stack? JA: It was about a hundred clients. But guess what. A hundred clients I got. Every single one of those clients? They were all worthless clients, because they bought a tax shelter that was that now worthless. JA: I’m like hey1 I’m drumming up new business with these people that are PISSED. AC: (laughs) That’d be tough. If you could get through that and you stuck in the industry. JA: Yeah, you’re just grinding out 100 dials, 200 dials a day. AC: You got a lot of determination. JA: You gotta make a game out of it. It’s just like how many people can call me a scumbag. That was the game for the day. AC: What was it, was at 25% or higher? JA: Yeah. Because people actually answered the phone back then so I could talk to them. AC: Because they didn’t know who is calling. AL: There was no caller ID. JA: Yeah. They thought I was their long lost son or something. No Caller ID, no Do Not Call lists and all that other stuff. AC: (laughs) Wow, that’s a tough way to break into the business. JA: Yeah, and then I bought a bunch of leads,I had to buy them for like $7.50, then used ones, I could buy ’em for a dollar. AC: Someone had just called them like two minutes earlier? JA: They were the ones that said, “go pound sand.” You could buy those a dollar if you really want to get punished. (laughs) So there you have it, that was the start something very special. I’ve got thick skin now. He does indeed, and if you work with him, you better have thick skin too…. Anyway – let’s get to answering your money questions. You’ve sent in a boatload of ‘em and we are churning through them fast as we can, but if we haven’t answered it yet, be patient – keep checking the show notes at YourMoneyYourWealth.com. If you want to add your money question, comment or suggestion to the list, you can you can email info@purefinancial.com, you can click the “Ask Joe & Big Al” button at YourMoneyYourWealth.com, you can call (888) 994-6257, or you can post your question on our Facebook or Twitter pages and the fellas will answer on the podcast. Find our social links in the show notes at YourMoneyYourWeatlh.com! 42:21 – Should I Sell Stock to Pay Back Taxes? JA: This one is from Shien Tze. What was that other name that I really enjoyed? JA: Mohan! Mohan should be introduced to Shien Tze. Great name. From San Diego. So Shien said, “hi I enjoy your shows. I’d like to ask you a question in regards to tax.” So I’m going to you, Al. JA: Tax claim – she owes back taxes of $217,000 and they’re charging her 7%. AC: Yeah I suppose. Yeah, you don’t want to have California be your creditor. And if you’ve got assets to be able to pay them off that’s a great way to go. And the same is true for the IRS, is they’re not necessarily the friendliest of organizations. Now you can potentially set up an installment payment plan with them, and you will pay the 7% interest. But if you miss a payment they’re all over you, and… I don’t know, I would, if you have the resources, if you’ve got enough stocks to do that, without knowing your situation, I would probably want you to do that. Now if that’s the only assets you have in your entire life, you probably don’t want to liquidate everything, maybe you liquidate part of it and maybe keep some of it for emergency cash reasons. Pay off as much as you can, set up an installment plan for the balance. So that’s what I think. JA: Or it could be something completely else. AC: Some kind of investment? JA: Someone saying “hey, put $217,000 in,” and 7% is… I don’t know. 7% interest on either side is high. AC: Yeah, right? So that was one way to answer the other way to answer, the other way to asnwer it is if you’re referring to some kind of investment? JA: At 7%, yeah I’d be pretty wary about that. AC: Well, and if you have to sell a bunch of stocks and pay a bunch of taxes to get there, maybe that’s not the best choice. So anyway, maybe we got you covered either way. JA: Yeah or maybe send us more information on this claim of $217,000. 44:58 – Should I Use Vanguard for Investing Advice? JA: All right. We got, let’s see… T.J. I want to talk about T.J.
AC: Wanna dive into T.J.? It’s like a long one. AC: She didn’t want to do that one. JA: Yeah. And I want to. AL: No, hey go for it. I think it’s great. JA: “Hi guys. I love the show. Thanks for keeping me entertained financially.” Oh, see? You’re welcome T.J.
AC: That’s why you want to read this one. AC: And anytime you compliment us, we’ll read your question. JA: “I’m 34 and my wife and I have $250k in retirement assets all with Vanguard. This is in my 401k (Roth & Traditional) and a Roth IRA for each of us. We max out the latter and I should max out my 401k next year or by 2020 for sure. I also have $3k in a brokerage account with Betterment. Love that I can buy those fractional shares. My question is should I partner with Vanguard Personal Advisor Services at only 30 basis points? I want them to help guide me to retirement, ensure I’m saving enough.” So he wants a little early retirement, possibly 55-60. “And saving for my 2 year olds college. I also think they’ll be helpful on withdrawing down the road. I get access to a dedicated CFP once I’m at $500,000 which it’ll be in 5 years or so. Vanguard feels like an extremely safe choice for financial planning assistance. Am I missing something? Thanks for your input guys!” TJ, I would go for it, bud. I like Vanguard. I think Vanguard is a phenomenal company. You got a couple hundred thousand bucks, 30 basis points is extremely inexpensive. You get $500,000, you get access to a certified financial planner that can talk to you on the phone and kind of help you out. Yeah. I think everyone needs some sort of personal advice just to kind of keep you in check. Some need a lot more than others. As your situatiom gets a little bit more complex you might want to look at a full service financial planning firm. But I think where T.J.’s at, I like where his head’s at. AC: Yeah, and I think I’m going to say I don’t know what you get at 30 basis points when you have less than $500,000, sounds like you don’t necessarily get it CFP. And so if there’s not a lot of services, maybe you wait. JA: Well, it’s a managed portfolio is what you get. AC: Yeah. If you need the help to manage it, right? JA: You don’t think people need help? AC: (laughs) Well they may. JA: Do you know the line of business you’re in? AC: Yes, I’m trying to un-sell myself. No, I would say it this way, I think a lot of folks – it sounds like they’re educated, like T.J., maybe they can get a book and look at asset allocation. Maybe they can do that, save a little bit of money, by the time you get to $500,000, maybe it makes a lot of sense because now you have someone else to talk to. But I do think by the time you get to retirement age, I would agree. I think probably a full service financial planning firm might be a little bit better. I don’t believe that Vanguard is going to help you very much with tax planning and ways to create tax efficient withdrawal strategies that a full service financial planning firm might. AC: (laughs) Well, it depends if you have the discipline. JA: Who has the discipline with their own money? JA: Bull-loney. (laughs) Look at Al. Guaranteed. JA: How many times, ah, we have tape of you talking about when you blew yourself up managing your own money. Remember you said you got out at the wrong time? AC: Oh yeah, that was… that was 1990. That was a while ago. But you’re right. Was I 34 then? Yeah I was about that. By then I’d made all my money. JA: Didn’t you just make moves in your portfolio? AC: Yeah, but now I know how to do it properly. (laughs) After 60 years. JA: (laughs) Okay. All right, go to YourMoneyYourWealth.com, we’ll see you again next week. For Big Al Clopine, Andi Last, I’m Joe Anderson, the show is called Your Money, Your Wealth®.